East Park Olive Leaf E... Buy New $24.99 (as of 07:20 EDT - Details) TEA from olive leaf is extremely bitter, and it is the bitter principle that is thought to have healing properties. Scientists have now isolated the bitter phytochemicals contained in the tree and leaves and have done significant research on these compounds. It is thought that these bitter compounds enable the olive tree to live for thousands of years by protecting the tree against insects and harmful microorganisms. Topical Lotion 4 oz by... Buy New $32.95 (as of 12:05 EDT - Details) For the DIGESTIVE SYSTEM, olive leaf helps alleviate symptoms caused by harmful microorganisms such as diarrhea and peptic ulcers. Olive leaf may also help alleviate certain CHRONIC IMMUNE disorders that may be caused by certain viruses or bacteria. These include chronic fatigue syndrome, fibromyalgia, and rheumatoid arthritis. EAST PARK Research D-l... Buy New $17.37 (as of 03:30 EDT - Details) Olive leaf is also considered a CARDIOVASCULAR herb. It is a potent antioxidant that may help prevent atherosclerosis by inhibiting oxidation of LDL cholesterol. Olive leaf increases blood circulation to the heart and improves the pumping action of the heart. Olive leaf also lowers blood pressure. I have always suspected that the real reason olive leaf works in this capacity is that it cleans the blood of yeast and fungus – both of these make the blood thicker and also increase cholesterol. 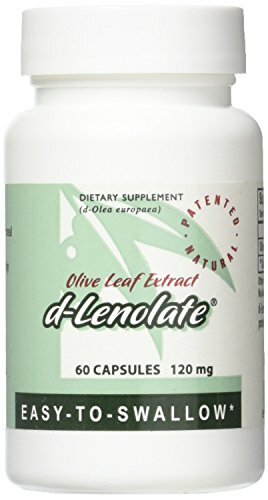 My favorite form of olive leaf is d-LENOLATE. It is a patented extract that I find works better than any other form of olive leaf. It comes in 500 mg capsules and in a topical lotion. It is also a main ingredient in d-Lenolate Plus – a great natural remedy for cold & flu. During FLU SEASON, I recommend taking 500 mg. of olive leaf daily. This can be doubled or tripled during acute periods of exposure to colds and flu. Previous article by Margaret Durst: Does Your Lymphatic System Need a Tune-Up?